We propose you to play the most exciting racing game, where you have to drive a car and just relax during your way. There is nothing to disturb you. This city belong to you. Drive like a crazy guy and enjoy the time you have played it. Have a lot of fun! Welcome to the desert city that belongs to you! Could you believe that? You are the only one here! 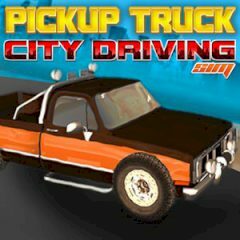 This cool truck is for you, so just drive it as fast as you can and you will definitely love this game. Step on the juice and do not stop. Be sure that here is no police to slow you down and no one to tell you off for driving into buildings. Just practice your jumping skills or just drive as fast as you like, but be careful not to roll your truck on its side. By the way, if you crash, it is not a pity, just restart the game and enjoy it again.